Miss Disco foaled what was to become one of the most important stallions in the world – on April 6 1954 at Claiborne Farm. The colt had an impeccable pedigree at the time being by Nasrullah out of Miss Disco by Discovery, and he would be named by his owner and breeder Gladys Mills Phipps, Bold Ruler. Over 85% of the stallions currently residing in KZN have his blood running through their veins. Bold Ruler almost lost his tongue in an accident in his stable leaving him very sensitive about his mouth – and quickly developed a reputation for being an accident prone horse after almost breaking a leg as a yearling after getting caught in his water trough in the paddock. Claiborne Farm’s owner Bull Hancock always kept Bold Ruler in a paddock at the back of the farm, as he had such a hard time conditioning the young colt and didnt want him to be seen by visitors to the farm. He was sent into training with Sunny Jim Fitzsimmons. 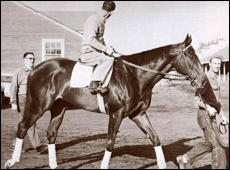 He broke his maiden the first time out on 9 April winning easily by three and a half lengths and as a three-year-old, Bold Ruler won the 1957 Flamingo Stakes while breaking a track record and then won the Wood Memorial Stakes. In the Triple Crown races, Bold Ruler went off as the favourite in the Kentucky Derby but faded down the homestretch after losing focus on the race and fighting the restraint of his jockey instead which exhausted him. He finished fourth behind longshot winner Iron Liege and Gallant Man (who was mistakenly pulled up at the 16th pole by Bill Shoemaker after he misjudged the Churchill Downs finish line. He began to rise in the stirrups and realized his error instantly, but it was too late. He threw off Gallant Man’s momentum just enough for Iron Leige to nose them out) and Round Table – who ironically was foaled the exact same night in the same foaling barn of Claiborne as Bold Ruler. At Pimlico, Bold Ruler beat the Kentucky Derby winner and won the Preakness Stakes by two lengths. Then came the Belmont Stakes, where Gallant Man avenged his own Derby loss by winning in 2:26 3/5. Bold Ruler ran a brave third, and it was later discovered that the effort had strained his heart. After the Belmont and its resulting layoff, Bold Ruler’s wins included a six length romp in the Jerome Handicap, as well as victories in the Queen’s County Handicap and the Ben Franklin Handicap, carrying 133 pounds in one and 136 in the other. In a muddy Vosburgh Handicap, Bold Ruler shattered the great sprinter Roseben’s fifty year old track record with his nearest rival ten lengths behind. Finally, Bold Ruler beat both Gallant Man and Round Table in the Trenton Handicap, despite carrying 130 pounds. During the next season, Bold Ruler won the Toboggan Handicap and the Carter Handicap, carrying 133 pounds in each, before he met Gallant Man in the Metropolitan Mile. Bold Ruler ran second, and was forced to redeem himself with a five length victory in the Stymie Handicap. In his greatest effort the brave son of Nasrullah beat the talented Clem in a fiercely fought Suburban Handicap. Giving away a remarkable twenty five pounds, Bold Ruler caught the lightly weighted Clem at the half mile. At the top of the stretch, Bold Ruler was ahead by two, but Clem made a run on the outside, catching and passing him. Bold Ruler gamely fought back and regained the lead in time to earn a trip to the winner’s circle. After one more win in the Monmouth Handicap, in which he carried 134 pounds, Bold Ruler badly injured his fetlock, finishing seventh in the Brooklyn Handicap. When x-rays were taken, it was discovered that Bold Ruler had been running with a two and a half inch bone splinter lodged in his tendon, and had probably been in a great deal of pain for some time. He had also suffered arthritis, nerve problems, torn back muscles, and a heart problem during his career. When the bone splinter was detected, the game horse was sent back to his birthplace to begin his stud career. In total his Race record stands as 33 starts, 23 wins, 6 places and $764,204. His performances earned him the Eclipse Award as 1957 Champion 3-Year-Old, Champion Sprinter, and Horse of the Year honours. At stud Bold Ruler was even more impressive and sired champions such as Speedwell, Queen Empress, Successor, Bold Hour, Bold Lad, Bold Bidder, Boldnesian, Vitriolic, Wajima, What a Pleasure, Lamb Chop, Gamely, Queen of the Stage, and most importantly the 1973 Triple Crown winner and two time Horse of the Year Secretariat. Bold Ruler was the sire of two good sons with the same name, one in America, Bold Lad, who was the 1966 American Champion Two-Year-Old Colt and one in England named, Bold Lad II who was bred and raced by Gladys Phipps’ sister, Beatrice. He is also the grandsire of Bold Forbes, Foolish Pleasure, Hall of Fame fillies Ruffian and Bold ‘n Determined, as well as Spectacular Bid. He is great-grandsire of Champion Sire-Of-Sires and Broodmare sire Seattle Slew. 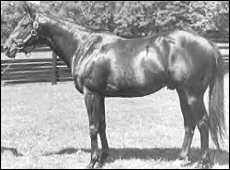 He led the American Sire’s List eight times, and seven of the ten Kentucky Derby winners of the 1970’s traced directly to Bold Ruler in their tail male lines. Bold Ruler was put down after he developed cancer in his sinuses and nasal passages. He underwent extensive treatment, including some experimental treatments and became well enough to cover mares for another season. But the cancer returned, and the decision was made to end the stallion’s suffering at Claiborne Farm in July 1971 and he is buried there. 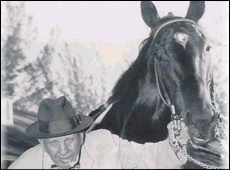 In 1973, he was posthumously inducted into the National Museum of Racing and Hall of Fame. 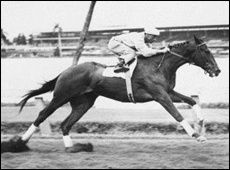 Bold Ruler was listed at No.19 in the Blood-Horse magazine ranking of the top 100 United States Thoroughbred horse racing champions of the 20th century.